In 1982, the Federation Internationale de l’Automobile rolled out a plan intended to rationalize the world of motorsport. Throughout the 1960’s and 1970’s, the governing body had relied on a system consisting of numbered “Groups”. However, a series of regulation changes severely muddied the waters, resulting in categories like Group 5 referring to vastly different types of car. In order to make sense of the mess, the FIA created three distinct categories based on the alphabet. Group A (Touring Cars) governed production-based race and rally machines, while Group B (Grand Touring Cars) defined looser interpretations of those cars, and Group C incorporated prototype racers as seen at Le Mans. A fourth letter was conceived for national championships, where the showroom stock Group N found a home. The many faces of Group 5. In the years that followed, the new regime helped rekindle manufacturer interest in motorsport in the wake of the devastating energy crises of the late 1970’s. Group A became a hugely popular discipline in touring car racing, and Group C rose to heights rivaling Formula One. Despite the immense competition, the third category sparked the public’s imagination like no other. With its incredibly lax homologation rules, Group B rally racing became the home of hugely aggressive, technological advanced, breathtakingly fast flame-spitting monsters supported by the best names in the business. After a sizzling debut by the all-wheel drive Audi quattro, Lancia, Opel, Peugeot, Toyota, MG, Mazda, Ford, Citroen and Nissan all constructed dedicated weaponry intended to conquer the world of rallying. Group B quickly became a fan favorite. Missing from this all-star list was perhaps the most famous racing company of all time: Ferrari. Although the Italian firm seemed like an unlikely candidate for the twists, turns and bumps of the rally scene, their cars had already been active in the sport. 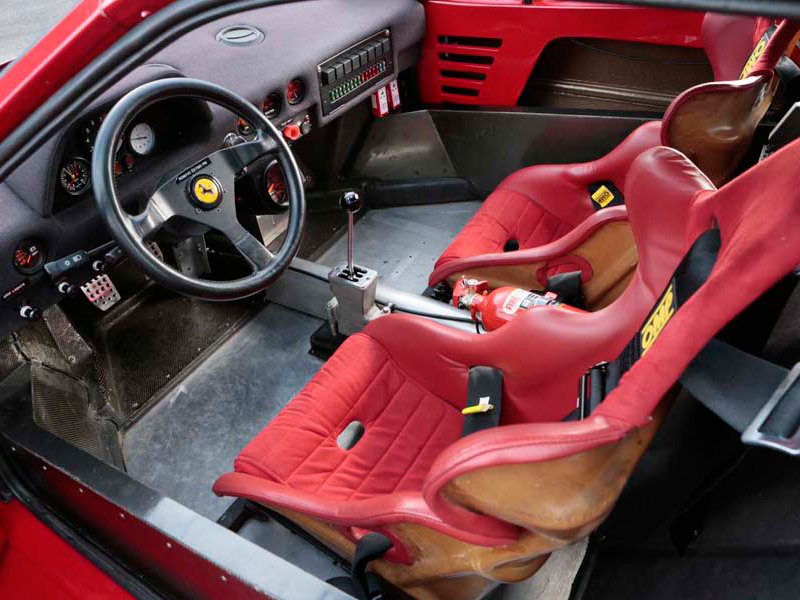 An unofficial collaboration with preparation firm Michelotto had given the world the Group 4 version of the 308 GTB, which transferred to a Group B homologation in 1982. Michelotto's 308 brought supercar flair to the rally stage. 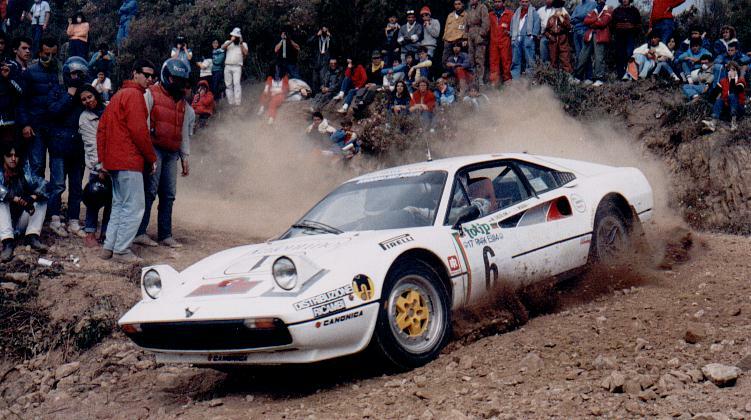 The collaboration between Michelotto and Ferrari eventually became a full on partnership after the Group 4 car performed very well on WRC tarmac stages, and the Italian Rally Championship. Seeing the potential for an official rally program, Ferrari commissioned a dedicated Group B car to take on the new rules. Michelotto took the 308 as a base, shortened the wheelbase and fitted the engine longitudinally to ease access to vital parts for quick services. Power was bumped to 370 horsepower, but the Hewland 5-speed manual transmission still drove the rear wheels. After one unsuccessful run where the 308 GT/M finished behind the Lancia Rally 037, Ferrari decided to drop the project, as neither naturally aspirated engines nor rear wheel drive were still competitive in 1984. The 308 GT/M was weighed and found wanting in 1984. After the failure of the 308 GT/M, Ferrari decided to take matters in their own hands. Since the GT/M had never been homologated, the Scuderia’s first focus was constructing the 200 examples needed. As a relatively small manufacturer, producing these cars was actually the biggest challenge. As with the previous rally Ferrari’s, the new machine would again be based on the entry-level 308 GTB. Taking the lessons learned from the Michelotto car, the new machine retained steel tubular chassis and the longitudinal engine layout, but incorporated a technology Ferrari was only just getting the hang of in Formula One: turbocharging. The longitudinal placement also freed up space for an intricate turbo/intercooler setup. Ferrari had first applied the dark art of forced induction in 1981, when it produced the innovative 021 hot-V twin turbo V6 for the 126CK F1-car. However, the company hadn’t been keen on introducing the technology in its road going models. This meant the de-bored 2.8L V8 was only the second road legal turbo engine Ferrari had made, after the peculiar 2.0L turbo V8 built to dodge Italian tax rules. With 400 horsepower and 496 Nm (366 lb ft) of torque, the unit became one of the most powerful on the market. The smaller engine size was chosen for a reason, as the FIA maintained a 1.4x equivalency factor to give naturally aspirated engines a fighting chance. At 2.8L, the car would be able to run in the 4000cc class, allowing for a lower total weight. At 1160 kg (2557 lbs), the 288 was capable of extraordinary performance. To honor the car’s racing intentions, it received the legendary Gran Turismo Omologato moniker, used only once prior on the mythical 250 GTO. The gorgeous 288 GTO was Ferrari's first serious turbocharged car. The car started production in 1984, and gained notoriety thanks to famous owners like Ferrari F1-driver Michele Alboreto, 1982 F1 World Champion Keke Rosberg and three-time World Champion Niki Lauda. On the 1st of June 1985, the 288 GTO was officially homologated for Group B competition, allowing Ferrari to start developing a competition version. Group B’s regulations required at least 20 of these Evolution models to be built to qualify for homologation. The Evoluzione sported a radically different body from its road-going sister. For the Evoluzione, Ferrari mutated the svelte retro-inspired 288 GTO to a jagged, widened square monster. Fiberglass and kevlar body panels inspired by both the old Group 5 512 BB/LM and the 308 GT/M were fitted to a lightened and strengthened chassis, netting a total weight of just 940 kg (2072 lbs). Furthermore, the Maranello motor maniacs had turned up the wick on the massive IHI turbochargers to make the V8 belt out 650 horsepower and 667 Nm (492 lbs ft) of torque. In a clear instance of form following function, the motor exhaled through two flat exhausts jutting out of the bodywork, with a third pipe serving as the wastegate outlet randomly placed off to the right. A reinforced 5-speed manual transmission handled the increased fury, but curiously still drove the rear wheels. In an era when all-wheel drive had become the undisputed king of rallying, this seemed to be an extremely misguided choice. Even so, there was a very good reason for this apparent oversight. Ferrari never intended to enter the the sport as a factory team, instead opting to take the same sort of role they had done in the past. As with the Michelotto cars, Ferrari wished to sell a bunch of the cars to select privateers, who would only compete in pure tarmac events. This way the factory would have all the publicity with minimal financial and managerial expenses. Instead, Ferrari had set their sights on an arena they were all too familiar with. When the FIA first announced their new nomenclature, Group B had been referred to as Grand Touring Cars. As such the category was never solely intended for the upper echelons of the rallying world. In fact, a Group B-based GT racing championship had already been planned. This not only explained Ferrari’s decision to retain the rear wheel-drive layout, but also the much longer wheelbase compared to the earlier 308 GT/M. Unfortunately, the need for homologation fell on deaf ears on the endurance racing establishment. Since the Group C prototypes active in the same discipline had no need for a massively expensive road variant, manufacturers active in the World Sportscar Championship failed to see the point of running a GT-car.As even the larger companies had no interest in competing with production-derived machines, and smaller factories didn’t have the means to, Group B GT Racing never had a chance. With only a few privately built Porsches occupying the category at Le Mans, Group B GT Racing was stillborn, and the regulations swayed to accommodate the rally cars instead. Only arch rival Porsche tried to follow Ferrari’s footsteps, but their 961 never fully reached homologation and was forced to compete as a prototype in 1986. With the road to GT-racing closed off, the only way for the Evoluzione to see action was in private hands at events like the Tour de Corse. But just as the first was reaching maximum combat effectiveness, Henri Toivonen and Sergio Cresto plunged into a ravine and burned alive in the 1986 edition of that very rally. This terrible accident, coupled to the tragedy at Rallye Portugal with Joaquim Santos’ Ford RS200, put an abrupt end to Group B and its proposed successor Group S. In one fell swoop, the 288 GTO Evoluzione had lost all relevance as a racing car. As a result the project was dropped, but six examples of the extreme racer had already been built. Before being sold off, these cars helped develop Ferrari’s fortieth anniversary present. 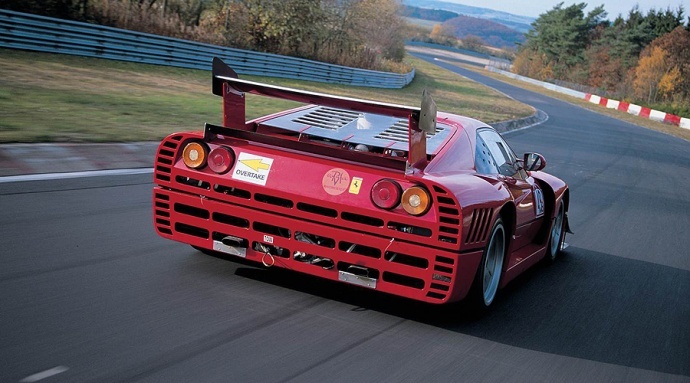 With some extensive modifications, Ferrari’s engineers managed to sufficiently blunt the GTO’s sharp edges off to make it roadworthy, and produced the legendary F40.